Garrott and I joined up with Scott and Deno's Monday night group for a poling clinic. Jay Tapper of ActivEdge helped spread the word and we had a great showing of 21 skiers. We had a good time giving our core a workout under the lights at OO. I worked with the group a few weeks ago and it was great to see the progression everyone has made. The group meets every Monday night at OO from 6-8pm. Everyone enjoying a HoneyMilk after the workout. HoneyMilk is a new recovery drink that the CXC Team has been testing which will be on the market soon. Join CXC Elite skiers Brian Gregg and Garrott Kuzzy for an on-snow ski clinic: Monday evening, February 2 from 6:00 – 8:00pm at the OO Trailhead on the Birkie Trail. 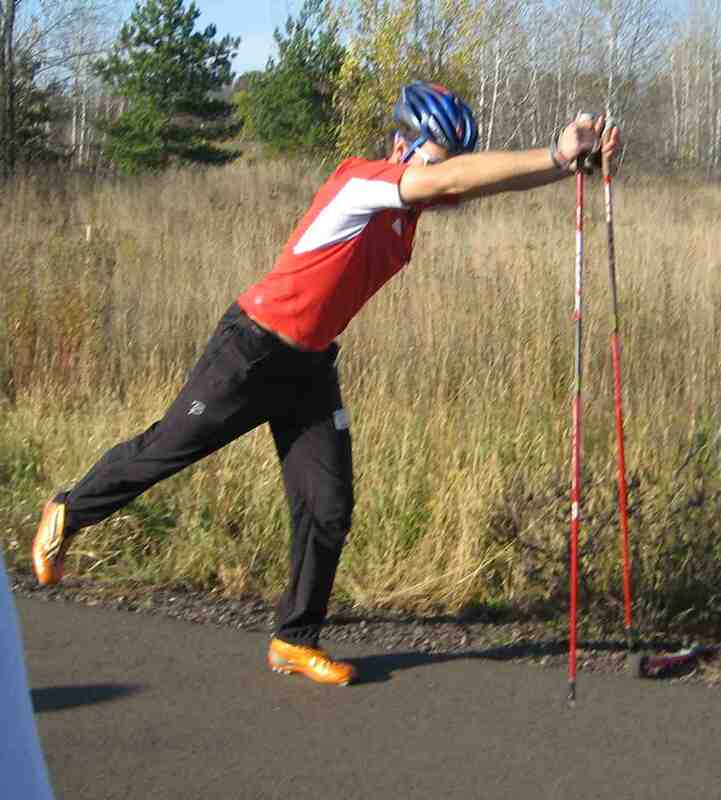 The clinic will focus on skate skiing, and specifically the application of upper-body power for poling. You will learn to pole with more power and more efficiency, which will benefit both skate and classic techniques. Cost of the clinic is $25 with proceeds going to Brian and Garrott to help cover their expenses during the 2009 ski season. The clinic is being hosted by ActivEdge, Jay Tapper’s physical training studio based in the Lenroot Lodge in Seeley. All ages and abilities welcome. Brian and Garrott’s fall dryland strength clinic was a great success with participants raving about how much they learned and how much fun they had. If you’re looking for a little inspiration just 3 weeks before the Birkie, be sure to show up to kick off your last-minute Birkie training or to hone your skills before the big race!